From the 16th to the 26th of February 2012, the Jameson International Film Festival will be held at a number of venues around Dublin. This festival, the largest of its kind in Ireland, will take celebrate everything related to movies, with many premier screenings in Dublin’s top cinemas. There will also be a variety of movie-related awards and events. Many well known actors will attend, to discuss the business and take part in question and answer sessions. 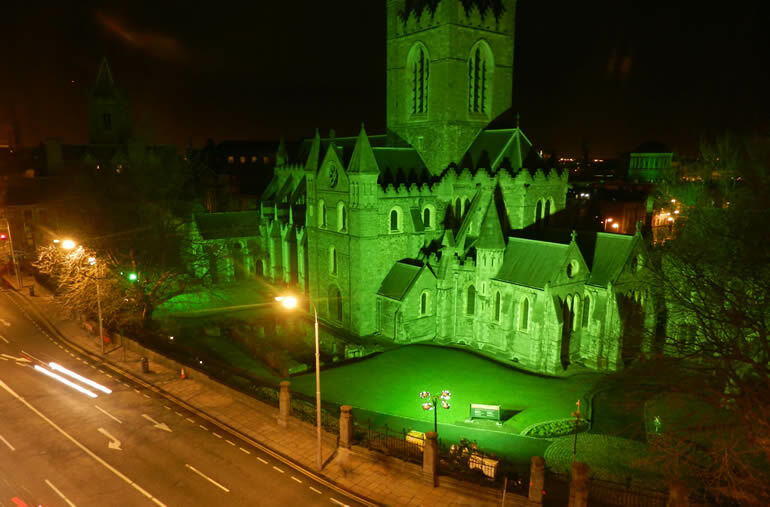 The St Patrick’s Festival will be celebrated around the country from the 16th to the 19th of March 2012. This is the largest celebration of everything that makes Ireland special. Street performers, competitions, song, dance and live music are just some of the events to look forward to in Dublin. The festival incorporates Ireland’s national day on the 17th of March (St Patrick’s Day), when musicians and teams of performers walking or riding on floats will begin the main parade at midday. They will depart from Parnell Square and make their way up O’Connell Street, then Dame Street, to reach their final destination of Saint Patrick’s Cathedral. The Dublin Pride Festival truly is a festival for everyone. It doesn’t matter if attendees and participants are lesbian, gay, bisexual, transgender, know someone who is or just want to open their mind – they are welcome here. Song, dance, poetry, performance and a range of contests and competitions mean that everyone will be entertained, regardless of their orientation. The highlight is the Post Parade Party, which has featured international musicians in the past. This year’s Dublin Pride Festival will run from the 17th to the 26th of June 2012, with the Dublin Pride Parade (one of the biggest Irish parades) taking place on the 25th. This will be the year that Dublin, as the City of Science 2012, showcases all that it has to offer in science, arts and culture at ESOF 2012. The Euroscience Open Forum is the biggest science conference in Europe and is taking place in Dublin from the 11th to the 15th of July. To mark this auspicious occasion, more than 160 events with a science theme shall be held throughout the year around Ireland. These include an eclectic mix of exhibitions, stage productions, movies, walking tours, lectures and much, much more. The aim is to create an interest in science, and encourage those with an interest in science to make new discoveries. In August 2012, an estimated 100 Tall Ships will sail into Dublin, the Final Host Port. They are all participants in the annual Tall Ships Race, a global event that concludes with the Tall Ships Festival. This will take place in the Dublin Docklands from the 23rd to the 26th of August, when the public will be welcome to explore the participating ships. They will also be entertained by street performers, concerts, competitions, water sports and a host of other events to look forward to. It is expected to be one of the biggest Irish festivals this year.